Specific Gravity bottles, weld, with cap. Specific Gravity Bottles Glass : 25 ml. 50ml. 100ml. Pycnometer type, for sand (1000ml) Top is spun brass with 10mm hole in one end; threaded end Includes rubber seal that fits on jar mouth to prevent fine particles from becoming deposited in the threads. It is used for measuring the specific gravity of viscous fluids, semi-solid bitumen and emulsion to used generally in construction works for roads and other related civil engineering works. Available in various sizes in neutral or borosilicate glass. 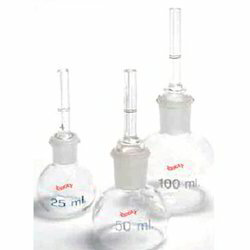 - The ordinary capillary type specific gravity bottle with a neck of 6mm diameter. 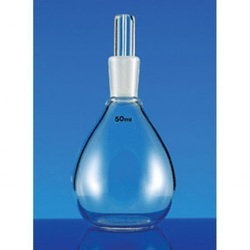 Spherical pattern, the volume of the bottles accurately adjusted at 27°C to the value etched on the surface.The bottle and stopper are numbered for identification made from Borosilicate glass.